The National Reconnaissance Office (NRO) released this photo of a Lockheed Martin-built Lacrosse satellite. This design is likely akin to the earlier Lacrosse 2 spacecraft. A 20-year-old U.S. spy satellite has been flagged by amateur satellite observers as missing in action – a sign that the classified spacecraft may have been purposely destroyed in Earth's atmosphere, skywatchers say. "I cannot rule out that it maneuvered to a much different orbit, but none of the five Lacrosses have ever made large orbit maneuvers, so most likely it was de-orbited on March 26," said Ted Molczan of Toronto, a leading satellite spotter and a member of a dedicated network of skywatchers around the globe. Lacrosse 2 launched into orbit on March 8, 1991, atop a powerful Titan 4A rocket from Vandenberg Air Force Base in California. Lacrosse satellites crank out high-resolution imagery using synthetic aperture radar, a technology that spots targets day or night and through cloud cover. While their orbits are hush-hush in officialdom, they are routinely spotted by skilled hobby astronomers. In fact, to the delight of the amateur observers, this Lacrosse provided a light show. It had an orange-red hue, thanks to its outer covering of gold-colored kapton insulation blankets. Molczan told SPACE.com that because Lacrosse 2 is such a bright object, it is likely to be spotted by chance within a few months if it remains in orbit. "The longer we go without a sighting, the greater our confidence that it has been de-orbited." According to a former intelligence officer familiar with National Reconnaissance Office systems, disposal of "sensitive satellites" is targeted for the far South Pacific, "where locating and retrieving any sensitive bits that survive re-entry would be very difficult." The expert also noted that the Lacrosse 2 was some 20 years old. "I'm amazed it was kept up anywhere near that long," the expert told SPACE.com. The story of the missing satellite was picked up by the Guardian newspaper in the United Kingdom, which noted that Lacrosse 1 was intentionally brought back into the atmosphere in 1997. Molczan underscored the fact that amateur satellite sleuths have long kept an eye on Lacrosse 2. The spysat’s lack of major maneuvers and low to moderate rate of orbital decay, he said, aided in keeping track of it. “But it still took a considerable effort on the part of the few observers active in our hobby. I have on file more than 5,700 observations by nearly 20 observers, five of whom produced more than 75 percent of the data,” Molczan told SPACE.com. There's a side story to intentionally nose-diving classified spacecraft into Earth’s atmosphere. It turns out that, over several decades , the U.S. Air Force has sponsored several studies of the breakup characteristics of satellites, Molczan said. The first appraisals were of U.S. Keyhole imagery intelligence spacecraft in the 1970s, as well as observations of the Lacrosse 1's de-orbit in March 1997, he added. In the case of the Lacrosse 1, a solar panel of that spysat was tracked as it fell through Earth’s atmosphere, with that object surviving re-entry. That being the case, Molczan said, it "confirms the wisdom of bringing these objects down over remote regions of the Pacific." According to a 2004 report by the Aerospace Corporation, numerous satellite re-entry experiments have been carried out for several decades. That history includes six satellite re-entry tests in the early 1970s, authorized by the Office of the Secretary of the Air Force at the request of White House staff members. The experiments were keyed to better appreciate satellite breakups, survivability of hardware, and dispersion of spacecraft leftovers tumbling to Earth. These revelations were utilized in deboost and strategy policy by U.S. Air Force officials. "Academia, most satellite and launch vehicle contractors, and other government agencies remained unaware of the experiments," the report states. Re-entry experiments involved different types of spacecraft structures. 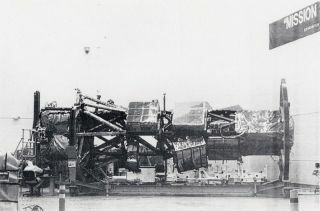 Debris was deliberately pinpointed to several locales, such as a remote region of Alaska, the Western Pacific to enable the use of large radar at Shemya in the Aleutian Islands, and Eniwetok Lagoon in the Marshall Islands. Numerous objects were recovered – items that surprisingly endured heat loads during their plunge, including circuit boards and other larger bits of equipment, according to the Aerospace Corporation's report. "Any satellite de-orbit is — or should be — carefully planned in order to minimize the debris footprint and the potential for public health or safety impacts. But when classified satellites or payloads are involved, there is an additional incentive to prevent the compromise of sensitive technology," said Steven Aftergood, director of the Federation of American Scientists’ Project on Government Secrecy. "I imagine that the satellite itself is constructed in such a way as to facilitate breakup upon re-entry," Aftergood told SPACE.com. "Even so, its trajectory would be chosen to ensure that any surviving debris entered over a remote ocean location." Similar in view is Tim Brown, senior fellow with Globalsecurity.org in Alexandria, Va., a group focused on innovative approaches to new security challenges. "My understanding is that some of the early reconnaissance satellites were retrieved from the ocean floor when they failed to achieve orbit," Brown said. "In later years they were de-orbited in a region of the ocean that was low risk to aircraft and ships and close to the United States … and easily reachable by submersible recovery vessels and later by unmanned remotely operated vehicles. I would imagine that deep-ocean recovery is part of the de-orbiting plan for every reconnaissance satellite."